With a stunning modern design that creates the illusion of light and space the Maya TV stand will complement any contemporary living area. 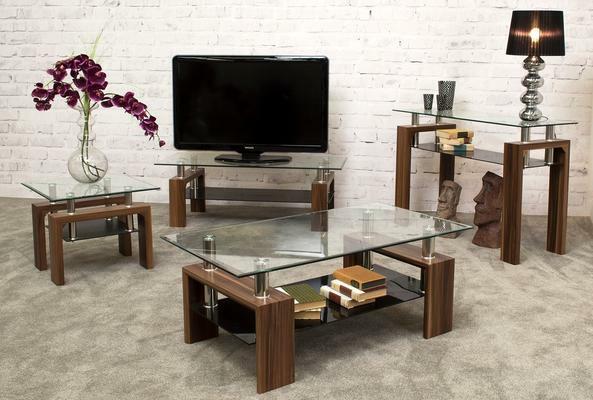 This unit features a tempered glass top and lower shelf, stylish Walnut veneer legs and chic stainless steel supports. The Maya collection is designed and manufactured by Vida living who have been supplying the UK with high quality furniture for over 30 years. Originally importers they have evolved in response to customer demand and now employ in house designers, fabric technicians and interior specialists to ensure their collections lead the way in terms of quality and design.